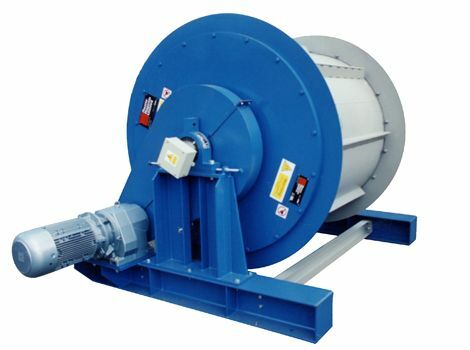 Bunting manufactures many types of Drum Separators, from Heavy Duty Electro Drums, for separation of ferrous from non-ferrous metals to Permanent Magnetic Drums for fine iron separation. 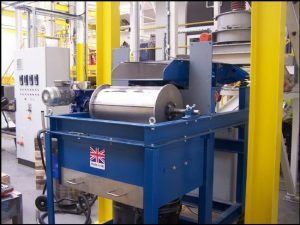 The Magnetic Drum Separator is normally installed at product discharge points and incorporates a 150 – 180 degree magnet system, encased in a stainless steel shell, or manganese wear plates for severe application. 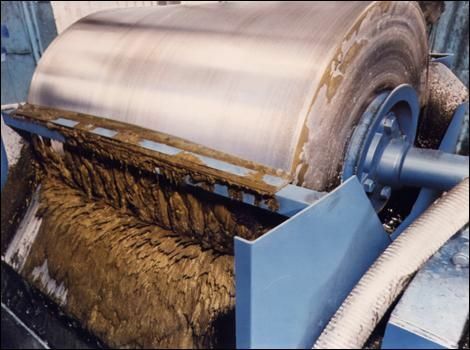 This system pulls iron contamination out and behind the clean product path and discharges it automatically while the clean product continues its normal trajectory. All drums are available with shafts to suit customer’s requirements, or furnished complete with drive systems, stands or housings. A complete range of housings are available to suit client’s requirements. 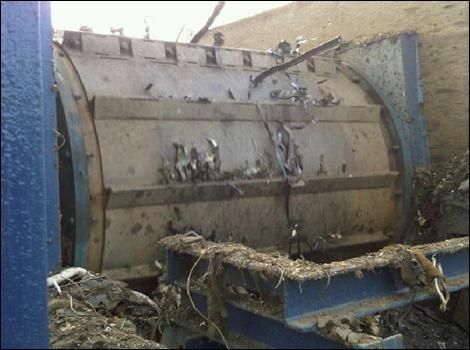 All magnetic drums are available in Electro or Permanent design or can be made with High Intensity Rare Earth Magnetic System, especially useful when contamination is mesh or micron size. 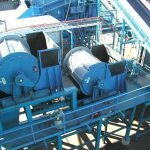 Based on volume of material being processed, density of material, size and amount of contamination, varying sizes are available to suit all applications and customer’s requirements. 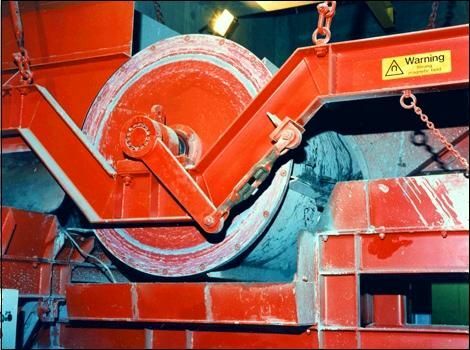 A single Drum Magnet, without housing, can be installed at the discharge end of chutes, conveyors or vibratory feeders or similar conveying machines for the removal of iron for product upgrading. 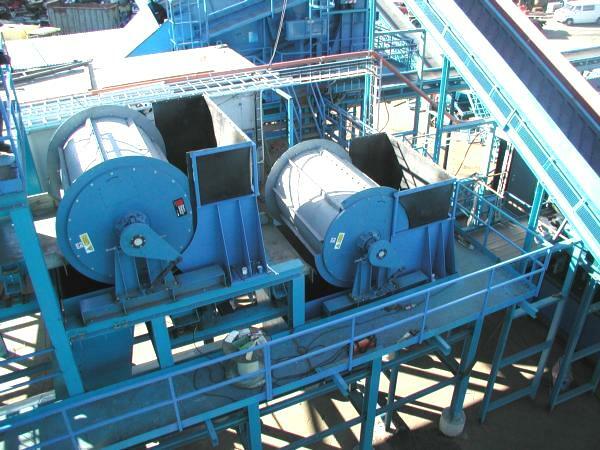 A Totally Enclosed Magnetic Drum, with housing and drive system, handles a variety of products, such as, grain, carbon black, fertilizers, food, chemicals, rubber, and other powder, bulk or granular materials, where the product is to be kept free from external contamination, and any dust being given off from the product is kept within the system’s housing. 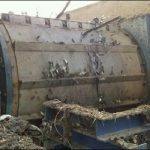 Fragmentizer Magnetic Drum Magnets are available for the automatic continuous separation and upgrading of ferrous from non-ferrous metals in scrap processing, steel bearing slag, foundry metal recovery, municipal waste and many other extreme heavy-duty applications. It can also be used for selective reclaiming of light materials for de-tinning processes. Alternating magnetic high intensity poles act as ’agitators’, at the point of extraction, lifting the ferrous metals and allowing non-magnetic materials to fall away. 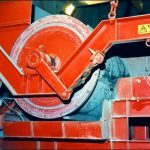 These very large Drum Magnets are available in sizes up to 72″ in diameter and 120″ in width to match customers conveying equipment or volume of material being processed. The axial pole design gives continuous high field strength at the separation zone. The effective magnet width is maximized thus ensuring even cover wear and minimum burden depth of material. 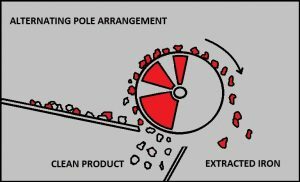 The bipolar alternate pole arrangement ensures a cleaner separation of ferrous and non-magnetic materials. 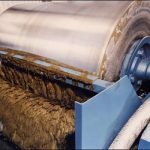 This is because materials, which may be entrapped are allowed to roll over the face of the drum, helping to release the non-metallic materials from the magnetic materials being extracted. 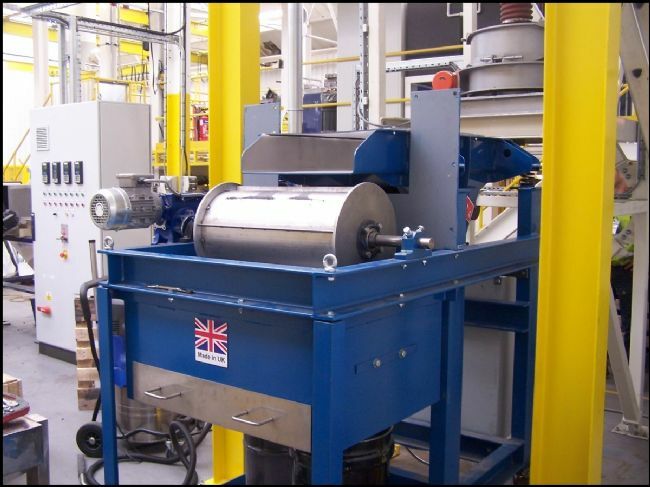 The high intensity primary coil concentrates maximum flux at the point of extraction whilst the lower intensity secondary coil ensures that ferrous material is transported to the point of discharge. Ducted coils give improved cooling, this results in a low winding temperature allowing higher intensity and a longer coil life. Wear covers 8mm thick minimum in manganese steel incorporate bolted joints for ease of cover replacement. 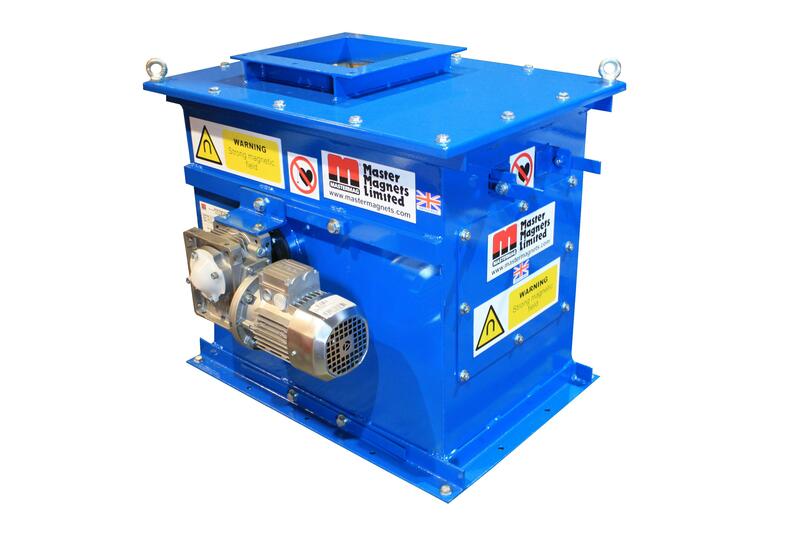 The Fragmentizer Magnetic Drum Magnet is offered in Electro, Permanent and Electro/Permanent Magnetics. The drums can be fitted with easy replaceable wear covers of stainless steel or manganese. The magnet system is locked in position by a heavy duty turnbuckle arrangement.